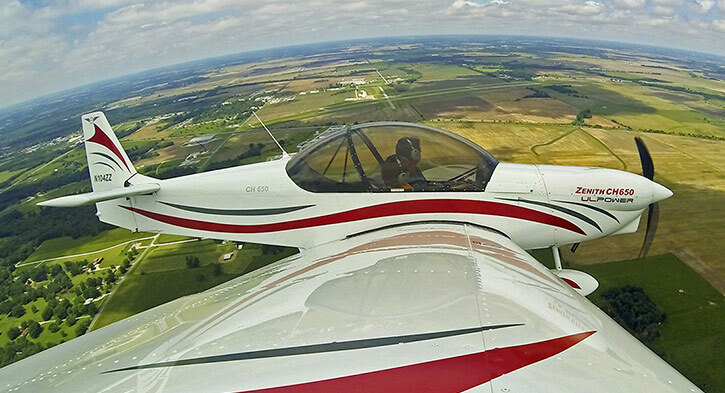 The Sport Pilot Ready Kit Plane from Zenith Aircraft Company! 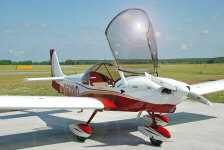 “...a playful, delightful airplane with side-by-side seating and a gorgeous bubble canopy. Handling is great, stability is pleasant, and the kit is very straight forward. 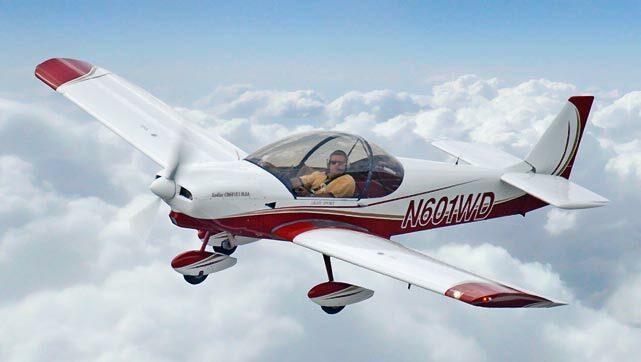 Based on the Zodiac CH 601 XL model introduced in 2001, the new Zenith CH 650 has been developed specifically to meet the FAA's Sport Pilot / Light-Sport Aircraft category, and offers maximum performance and capability possible under the new FAA category. With new and updated features and modern styling, the Zenith CH 650 replaces the Zodiac XL model. New aircraft models, like the Zenith CH 650 and the new STOL CH 750, keep Zenith Aircraft Company at the forefront of the light aircraft industry. 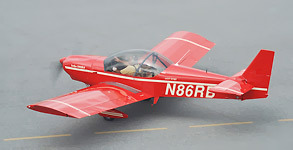 This newest model introduces refinements that compete directly with European imports in the Light Sport (LSA) marketplace, while still offering an exceptional value and choices, allowing builders to construct the CH 650 from complete kits, component kits, or even from plans-only, and offering kit builders a wide selection of engine choices to power their aircraft. The Chris Heintz-designed CH 600 Zodiac spawned a series of designs, each of them an improvement over the earlier iteration, and each became easier to build and more versatile in the air. 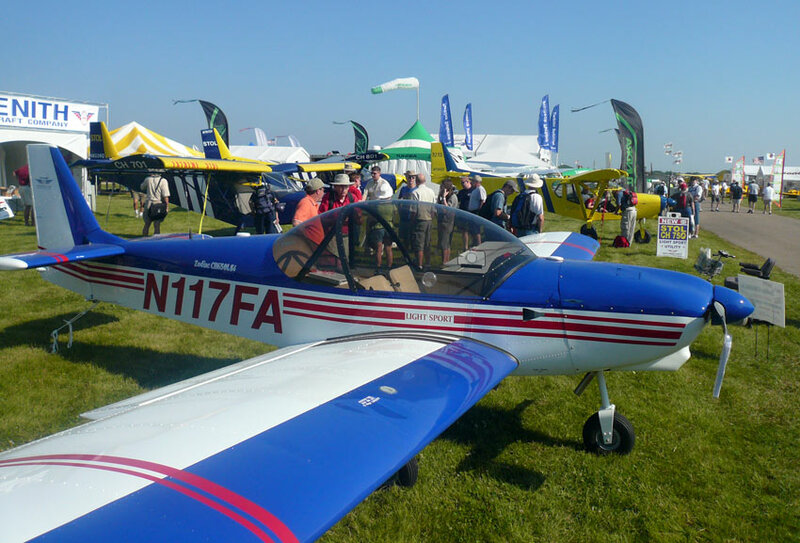 The latest models, the CH 650 LS AND LSi, introduced at AirVenture 2008, combine the best of a European-built CH 601 XL sold as a ready-to-fly aircraft, the AMD CH 601 XL sold as an S-LSA, and the Zenith Aircraft Company's amateur built CH 601 XL kit. 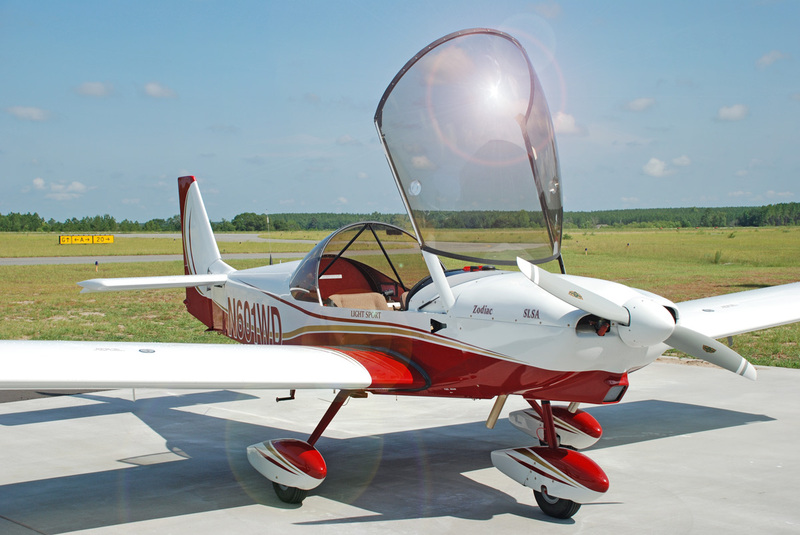 In deference to the CH 650 LS's anticipated role as a primary trainer, its landing gear is tougher and sports standard aviation 500-by-5 wheels and brakes. The gear system is bigger, making the aircraft taller, and the AMD main gear spring is gun-drilled, for cleaner, more protected brake line routing. Much work was done to the controls, which are now more balanced for better feel. "The 650 LS's airframe structure and flying characteristics are now more like an FAR 23 type aircraft," said AMD Sales Director John Degonia. 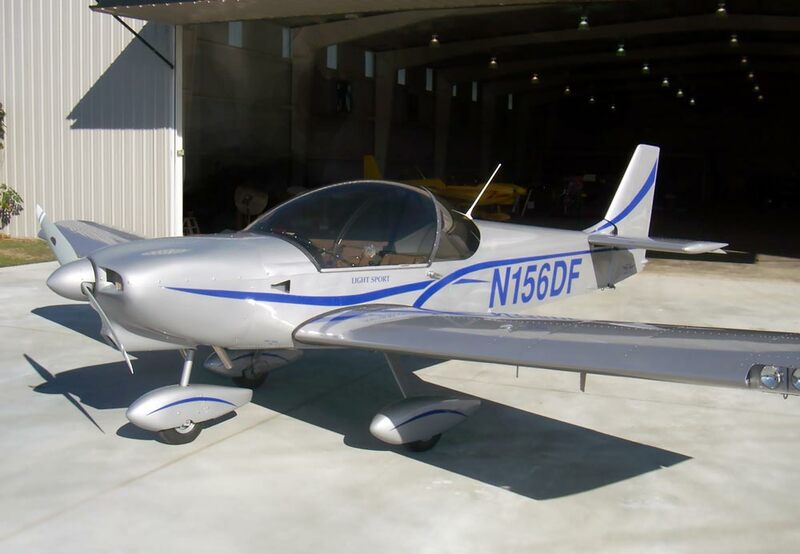 "Flying schools and pilots who were looking at buying an FAR 23 aircraft have now committed to the 650." 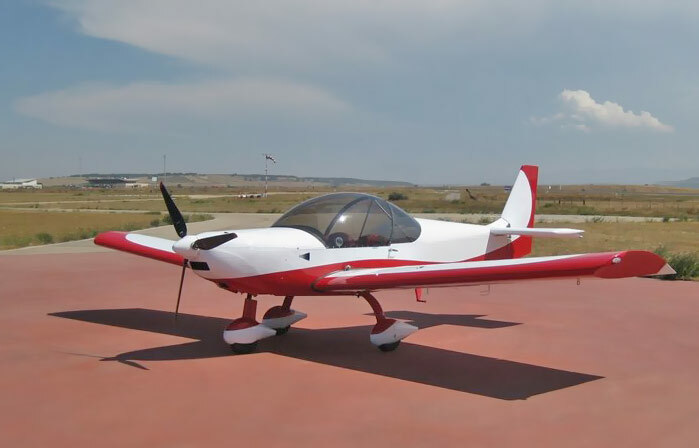 In the experimental kit version, the CH 650's firewall-forward will accommodate a Jabiru 3300, Lycoming O-235 or -233, or Rotax four-cylinder powerplants as alternatives to the S-LSA version's TCM O-200. Note: We are currently updating our website to reflect the new Zenith CH 650. Note that most of the information contained on the Zodiac XL design is the same as that for the newer CH 650 model. 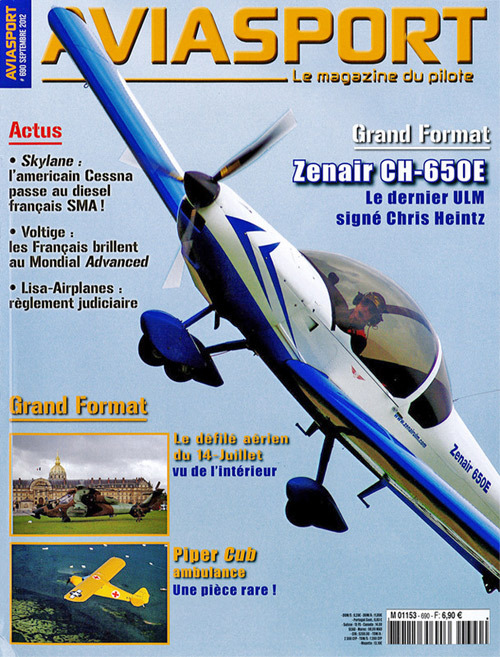 Download and Print Information: Zenith CH 650 Basic Brochure (2 pages). 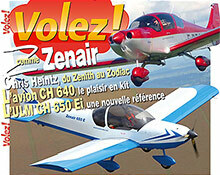 Download and Print Information: Zenith CH 650 Brochures and 3-views (5 pages). Simple and quick to build — easy and fun to fly! The new Zenith CH 650 design offers superior performance and capabilities, comfortable side-by-side seating, affordable costs, and best of all, the Zenith is available as a durable all-metal kit that you can quickly build yourself - with just basic skills and tools. 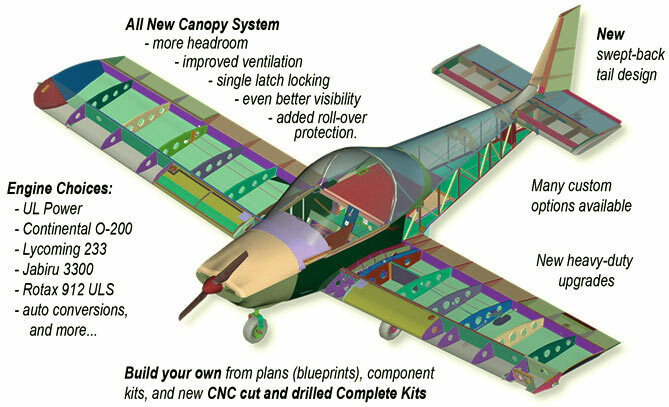 Plans-Only: CAD Drawings and Photo Assembly Manuals permit you to "scratch-build" the entire aircraft (parts and components can be purchased individually). Starter Kit: The rudder starter kit allows you to gain hands-on experience while actually starting to build your own aircraft... for just $375. View the illustrated parts catalog for the CH650 B for an overview of the assemblies. 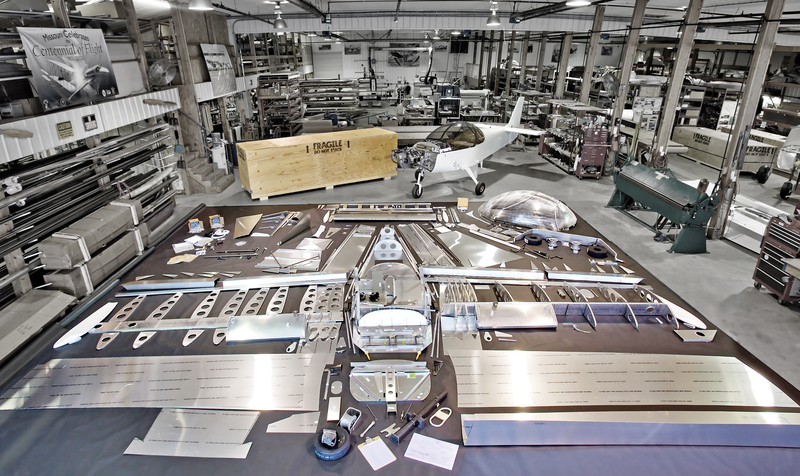 We invite you to come visit the factory in Mexico, Missouri to see how the aircraft kits are manufactured, go up for a demo flight (by appointment), and attend a factory workshop to gain hands-on kit building experience. Easier and Quicker to Build! The standard kit for the Zenith CH 650 includes many precision CNC pre-cut and pre-drilled skins and components, and also includes CAD Drawings and Photo Assembly Manuals. 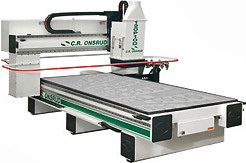 Click here to view a video clip of parts manufacturing with the CNC router (5.75 mb). For the latest, visit the exclusive ZENITH.AERO Online Community for news and updates from the factory as well as from Zenith builders, owners and pilots from around the world. 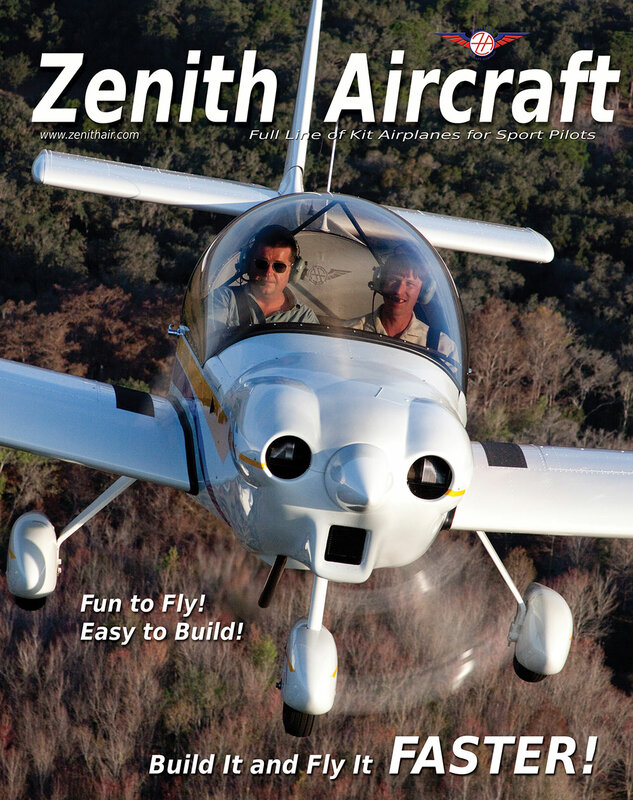 New for 2015: We've published a new Zenith Aircraft magazine, chock-full of information on building and flying your own Zenith. This free 48-page full color magazine provides an excellent introduction to the world of recreational flying and kit aviation, and covers all Zenith aircraft kit models, including the Zenith CH 650. 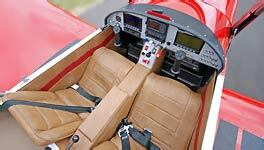 Contact Zenith Aircraft Company to have one mailed to you. 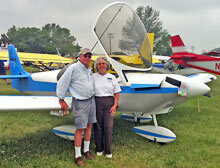 Bob Rychel's two Zenith planes: "Two Planes in Three Years"
"My CH 650 was a joy to build and is a joy to fly." 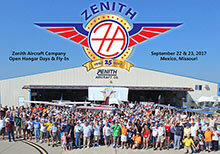 What an awesome week it was, where an entire Zenith kit was built in seven days, and then flown! Thank you to all who helped with this project, especially the volunteers and sponsors! A walk around the Zenith CH 650 Quick Build Kit (with the optional jigged canopy). 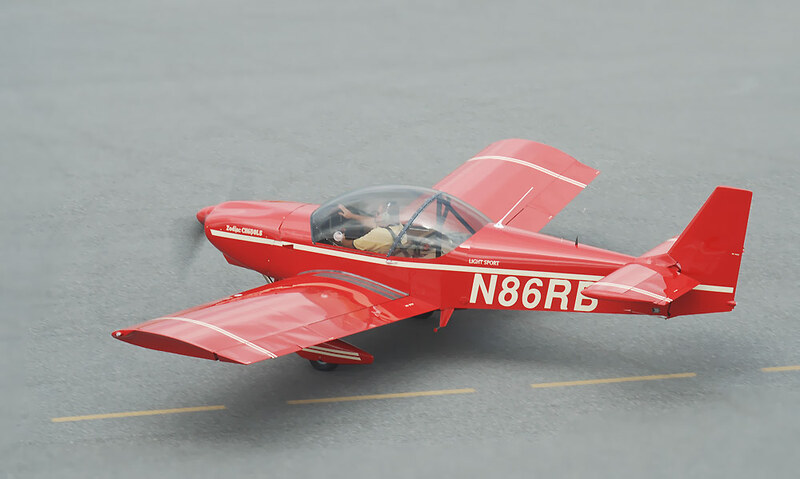 The CH650 can be built from plans-only, individual parts, component or complete kits, or from the Quick Build Kit. Updated New X-Plane 10.20 Flight Simulator files for the Zenith CH 650 (now supports 64-bit computing!). Fly the Zenith cruiser from your armchair! On the cover of Volez! 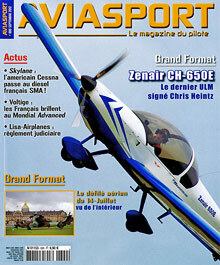 magazine (French Flying), Issue 177, February 2013. Cover story with a 12 page feature story on designer Chris Heintz and the Zenith CH 650 and the four-seat CH 640 cross-country cruiser. 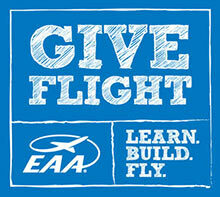 More press reviews and flight test reports. 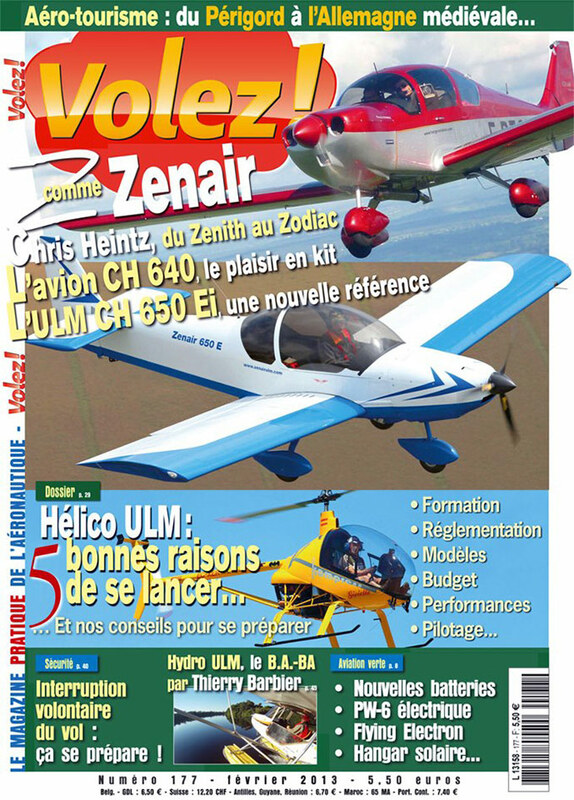 On the cover of AVIASPORT magazine (from France), September 2012 issue, cover story: "Zenair CH 650E (European model): The latest light sport aircraft from Chris Heintz." 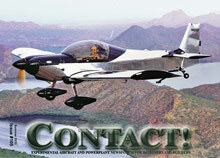 On the cover of CONTACT! 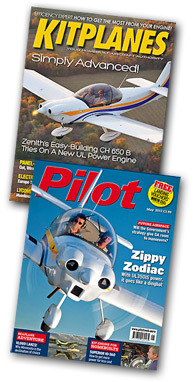 magazine, Issue 105, cover story and joint "Zenith / Corvair" issue, with 8 separate articles on Zeniths. From the introduction by editor Pat Panzera: "Recognizing Chris Heintz and his family business is something I've wanted to do for a long time, and I can never get tired of publishing information on the Corvair [engine]. 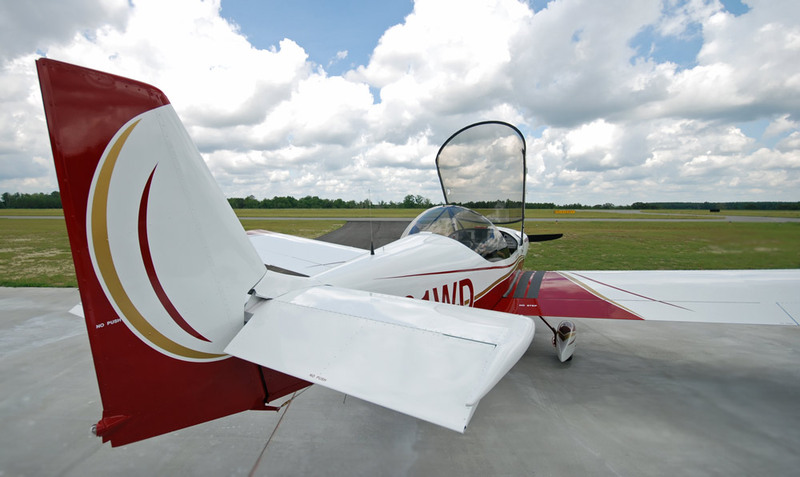 The two seem to have been made for each other, as do the efforts of William Wynne and Zenith"
Hear the 130-hp UL350iS engine on the Zenith CH 650 cruiser kit plane. 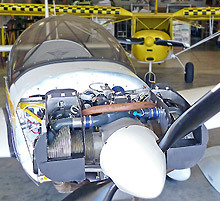 The UL Power engine is a modern light aircraft engine: Direct-drive, air-cooled, electronic ignition and fuel injection, with FADEC (full authority digital engine control). 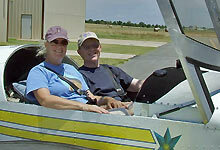 Zenith builder and pilot Earl Downs reports that he's just recently received a FAA Letter of Deviation Authority (LODA) to provide commercial training in the Zenith that he built himself: Earl is a CFI and a sport pilot designated flight test examiner who built a Zenith Zodiac CH 601 XL-B, and he is now approved for training in his Zenith. For more information Earl can be reached in the evening (central time) at 918-840-2200 or email (based out of Cushing, OK). 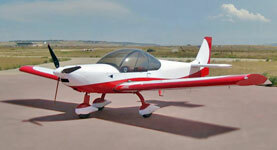 This is a new video clip from France of the new European CH 650 (powered by Rotax 912 ULS). KITPLANES magazine, June 2012 issue, cover story: "Simply Advanced" Cover story and flight review by Marc Cook, pages 8 - 17. 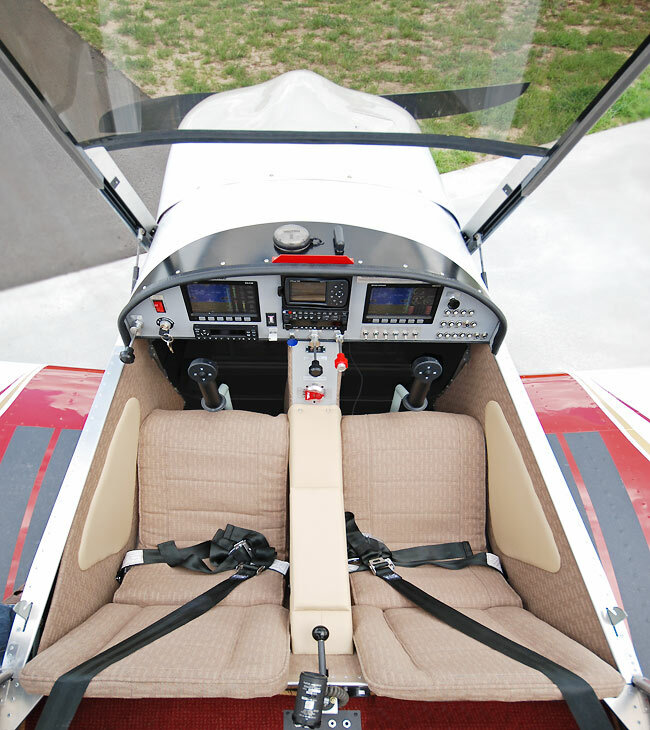 "New to the CH 650 B is a canopy that provides excellent visibility even for tall pilots. It's a comfortable cabin for two..."
PILOT magazine, May 2012 issue, cover story: "Zippy Zodiac" Cover story and flight review by Dave Unwin, pages 26 - 32.
it offers exceptional value for the money." 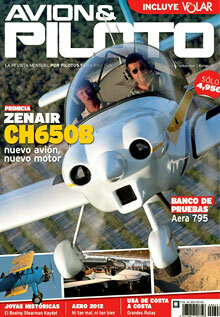 The new Zenith CH 650 with the UL350iS engine, on the cover of Spain's Avion & Piloto magazine (June 2012). 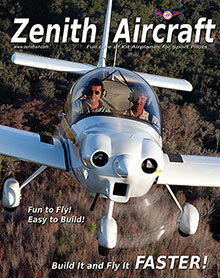 Kitplanes magazine photo previews of upcoming flight review of the Zenith CH 650 cruiser. 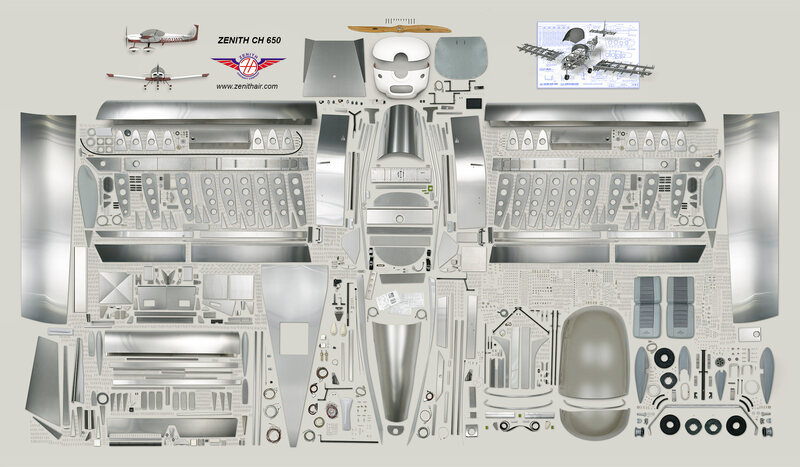 The UL Power Firewall-Forward (FWF) kit package from Zenith Aircraft Company. Shown here: The 130-hp UL350iS powerplant in the CH 650 cruiser. Video Clip: UL Power Firewall-Forward (FWF) package kit. 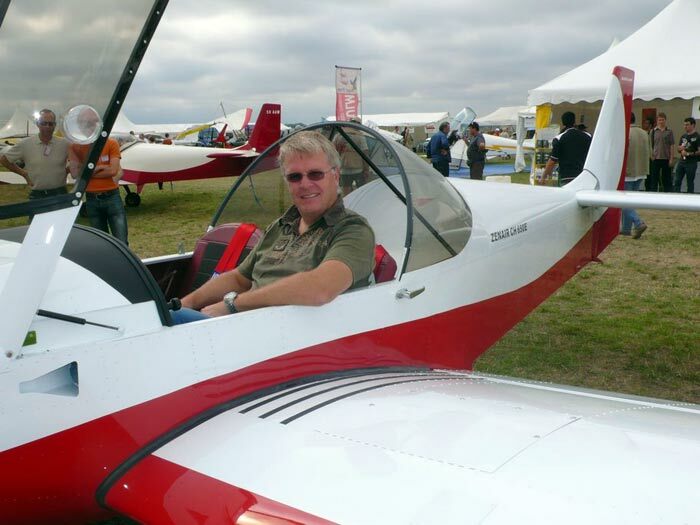 Dan Johnson interviews Zenith Aircraft Company's Roger Dubbert about the full line light sport aircraft kits from Zenith, including details on Zenith's CH 650 with the UL Power UL350is engine installation. 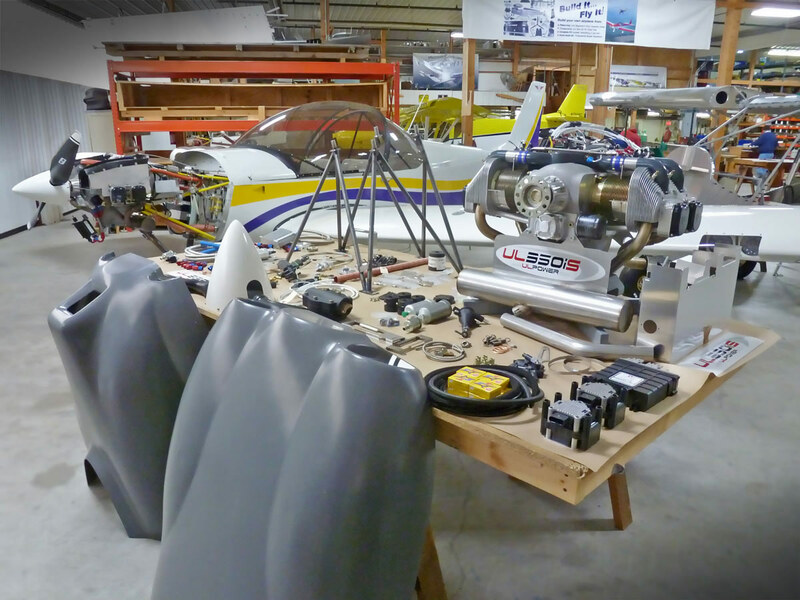 Zenith Aircraft Company and UL Power North America announce availability of complete firewall forward kits for the UL Power engine following the successful installation and testing of the 130-hp UL350iS powerplant in the CH 650 cruiser. The new Zenith CH 650 demo aircraft equipped with a brand new UL350iS engine installation and prototype cowl. More new photos. "The building process was thoroughly enjoyable and an exceptional learning experience. 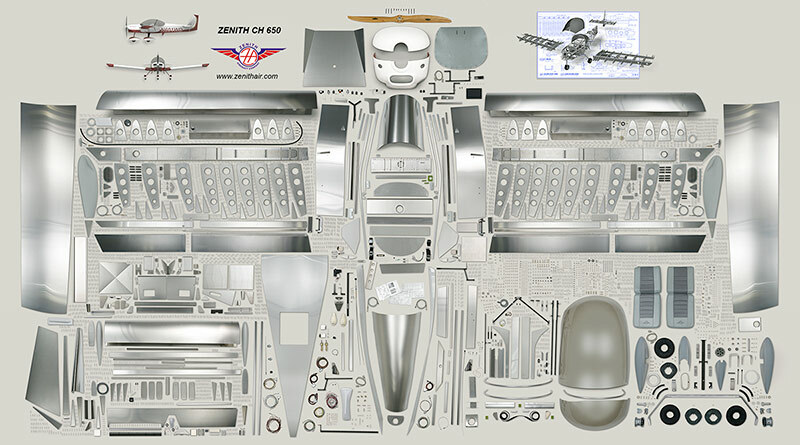 Zenith was helpful with the coordination of the new CH650 kit parts and their new CH650 drawings. Without a doubt, William Wynne is the Corvair engine conversion expert." 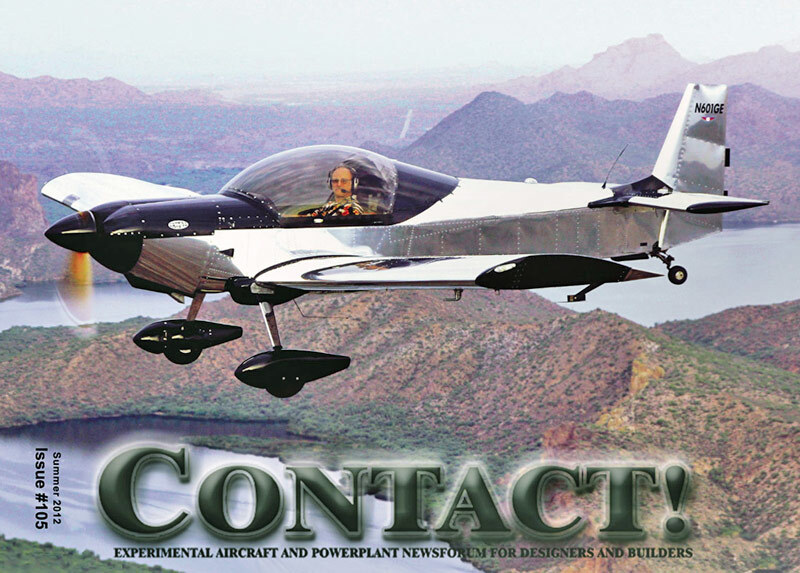 The July 2011 issue of Aviation Consumer magazine has a feature story / flight report on the CH 650 LSA: "Based on the CH601, the design is sporty and fast and has a new, beefed-up wing structure." 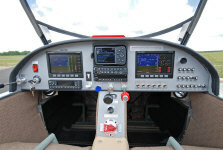 Aviation Consumer editor Paul Bertorelli writes that "The CH650 has superb cockpit visibility... The baggage compartment, which is adequate if not generous, is an easy-to-access shelf behind the two seats. That makes it perfect for grabbing stuff during cross-country flight." 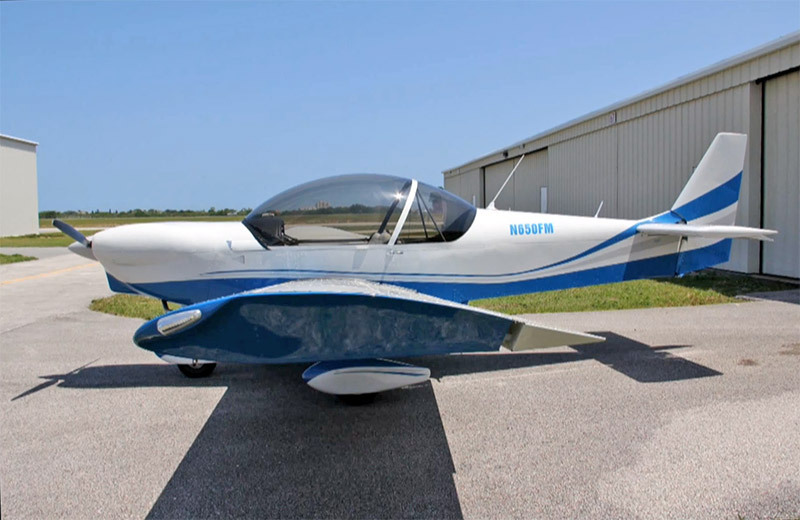 He concludes that "...the CH650 seems like an honest, straightforward low-wing cruiser..." and that kit manufacturer Zenith Aircraft Company "stands behind what is designs and builds." 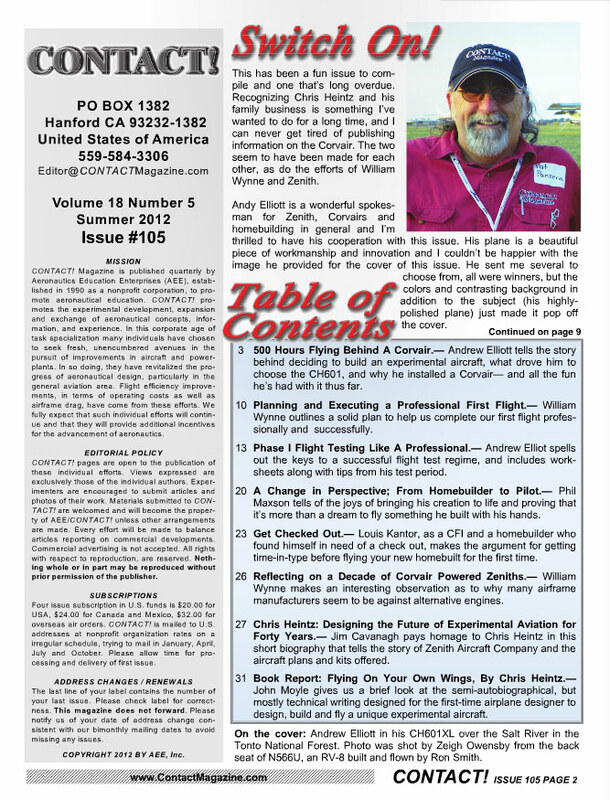 Excerpted from Aviation Consumer magazine, July 2011 issue, pages 13 - 16. Read more press reviews. Zenith's new factory demonstrator CH 650 with UL Power's new powerful yet lightweight UL350iS engine: This four-cylinder, direct-drive air-cooled engine puts out 130-hp with an installed weight of just 172 lbs., and features full FADEC (full authority digital engine control) with multi-point electronic fuel injection and dual electronic ignition (with variable timing). Click here for more details on this engine. Hear it and see it! Click here to view a HD video clip. 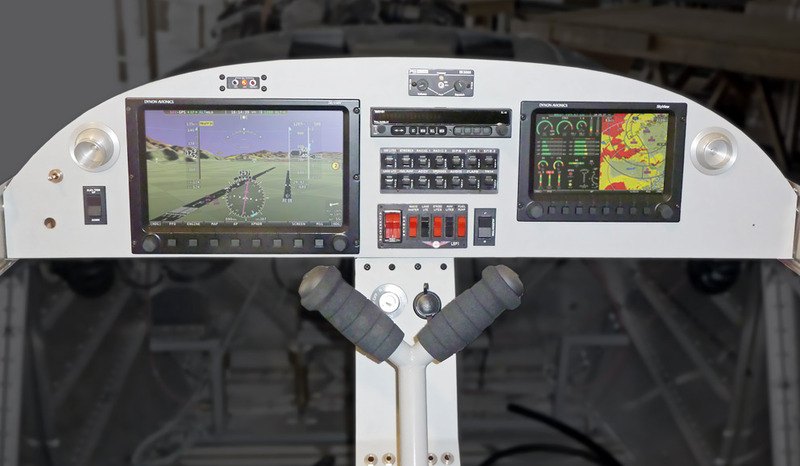 The instrument panel of Zenith's new CH 650 factory demo aircraft features dual Dynon SkyView glass panel multifunction displays. 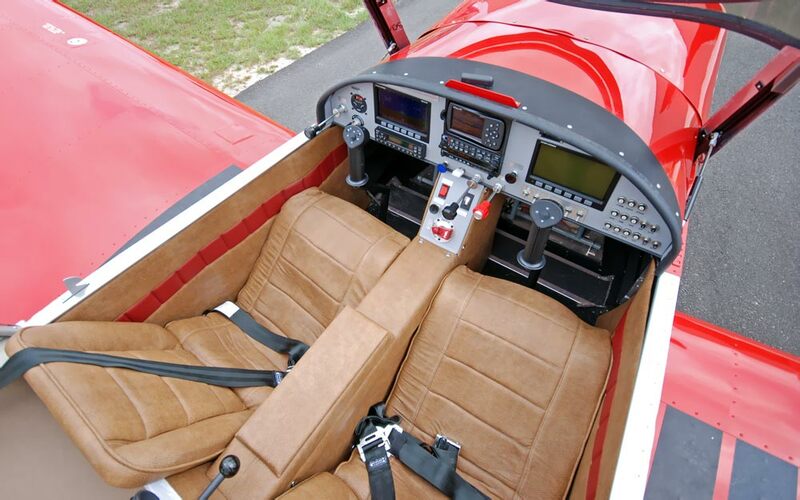 As a sleek cross-country cruiser, the autopilot will be a welcome feature in the CH 650 kit plane on long cross-country flights. Steve A. and Ron G. each picked up a complete kit of their favorite aircraft yesterday: A CH 650 for Ron and a CH 750 for Steve. Despite some rain, they loaded the two complete airframe kits in the Budget rental truck for the drive home to Detroit (where the two are GM engineers). 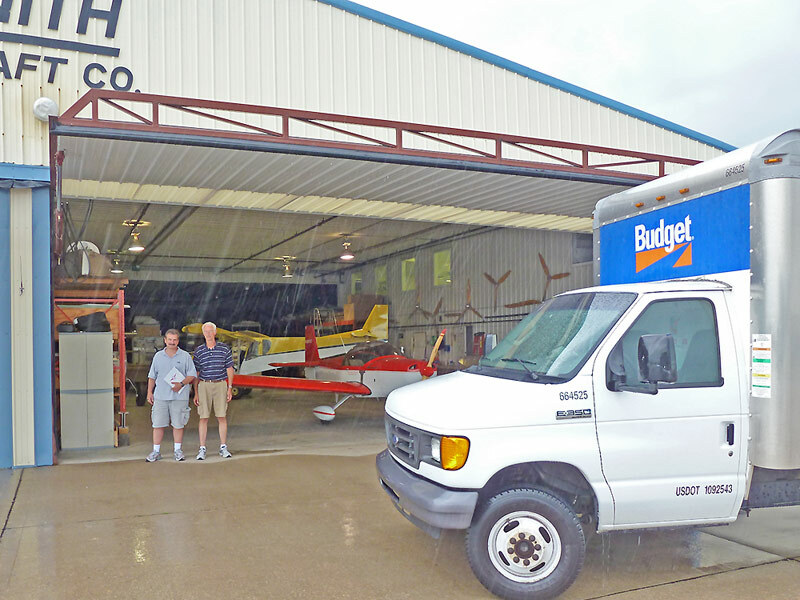 By picking up the kit at the factory, Steve and Ron saved both the crating charges and the freight charges, and they were able to share the rental truck fees, while also being able to visit the factory (for the first time) and go up in a demo flight in the aircraft. 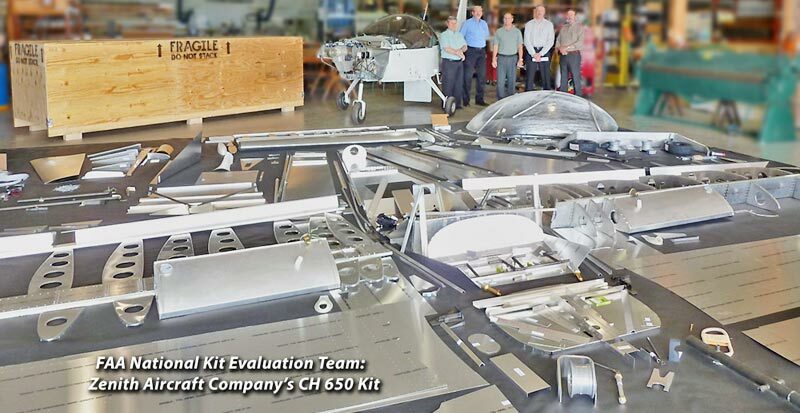 FAA's National Kit Evaluation Team (NKET) visited the Zenith Aircraft Company factory to evaluate and determine that the CH 650 B kit meets the intent of the "51% rule," allowing an amateur-builder to register the plane as an "amateur-built - Experimental" (kit) aircraft (meeting the "major portion" requirement of Title 14, Code of Federal Regulations part 21, Certification Procedures for Products and Parts, � 21.191(g). Zenith introduces the ULPower engine on the sleek new CH 650. 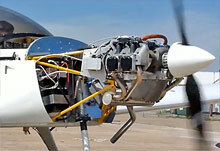 The ULPower engine is a lightweight direct-drive, air-cooled engine with full FADEC. 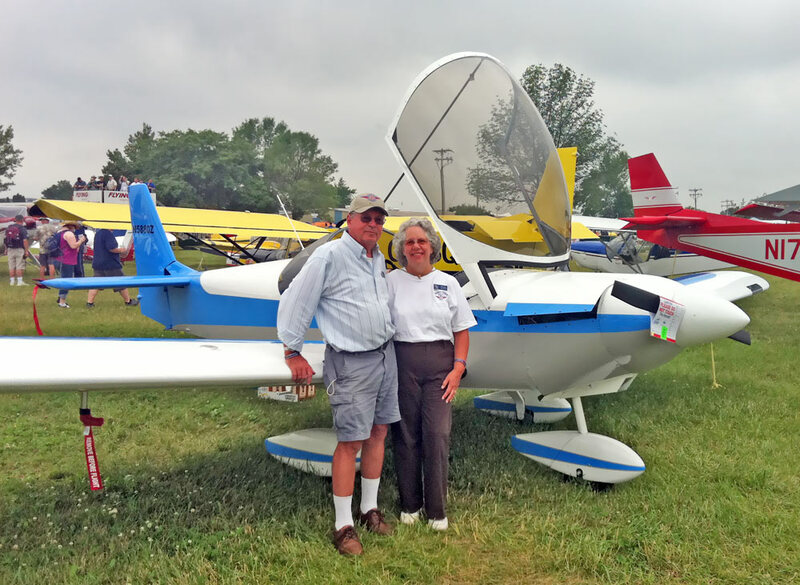 "I initially considered the AMD CH650 because I wanted a special light-sport aircraft (S-LSA) that was approved for night flight and instrument flight rules (IFR). 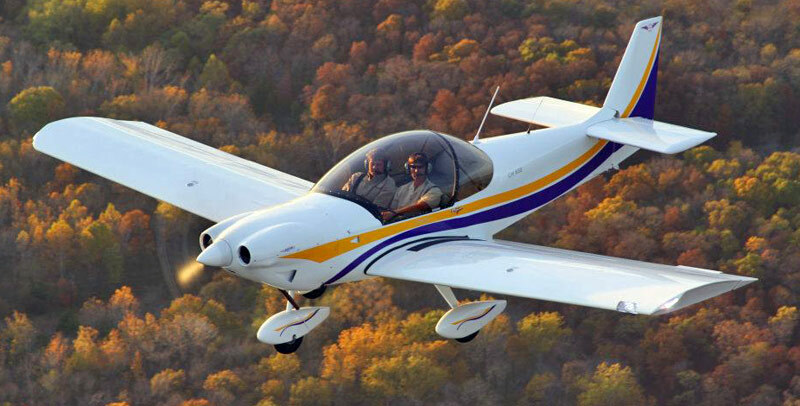 I like the idea of working with a U.S.-based company, and it turned out to be a good decision... As an instrument trainer, the CH650 is economical, stable and provides an approach speed that gives the student time..."
- Y. Forsyth, Gaithersburg, MD (Excerpted from EAA Sport Pilot magazine. December 2008). 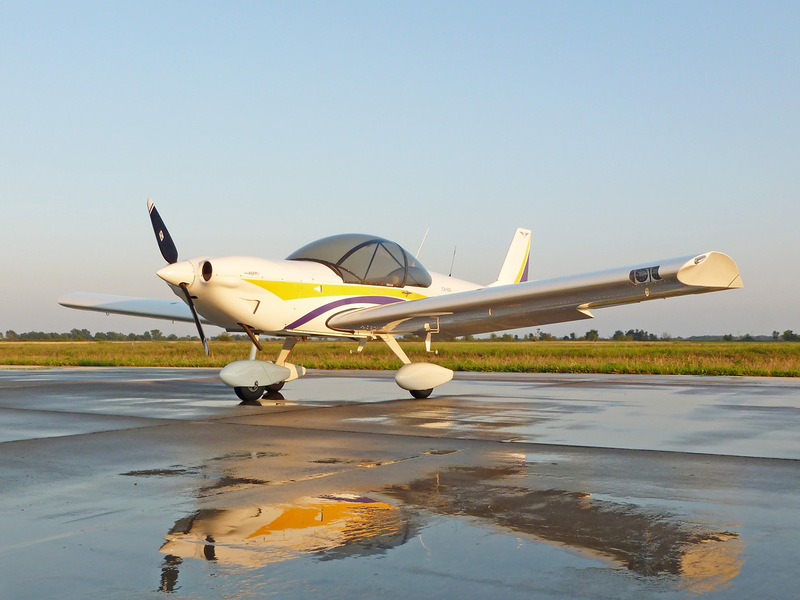 IFR-certified AMD Zodiac S-LSA production aircraft with a 100-hp Continental O-200 powerplant for Sport Pilots. 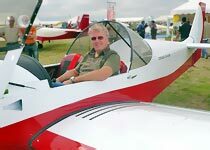 The European model of the new Zodiac CH 650 features a lower weight (to meet European ultralight or microlight rules) and the 100-hp Rotax 912 ULS powerplant. A clean and simple, yet very complete, custom Zodiac glass panel. Notice the dual control sticks.